The objectives of the mission would be searching for biosignatures at the subsurface, to characterize the composition of non-ice near-subsurface material, and determine the proximity of liquid water and recently erupted material near the lander's location. The United States Congress issued a congressional directive about a Europa Lander, and NASA initiated a study in 2016, assessing and evaluating the concept. NASA's Planetary Science Division delivered its report in early February 2017. This was a six-month long study to produce the concept. It was produced by what is called a Science Definition Team or SDT. The study assesses the science value and engineering design of a potential Europa lander mission. The primary mission goal is detection of organic indicators of past or present life. This would be the first time in forty years that a NASA mission would have a present life-detection strategy evaluated as a main goal. The last time was the Viking program in the 1970s. (see Viking lander biological experiments) The lander was described as a logical follow-up to the Galileo orbiter and probe mission in the 1990s, for which a major result was the discovery of conditions on Europa that may support life— in particular a large sub-surface ocean. Earth life can be found in essentially all locations where water is present. It follows that Europa is an excellent candidate in the search for life elsewhere in the Solar System. 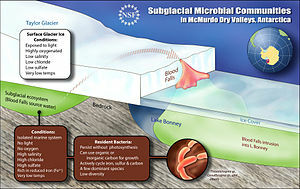 This subsurface water may not only be warmed by geological activity, but likely also enriched with dissolved minerals and organic compounds. Various ecosystems exist on Earth without any access to sunlight relying instead on hydrothermal vents or other sources of chemicals suitable to energy production by extremophiles. (see chemosynthesis) Measurements to date indicate that Europa has an ocean approximately twice the volume of Earth's oceans. This water layer below the ice may be in contact with the moon's interior allowing ready access to hydrothermal energy and chemistry. Europa surface missions can take advantage of the relatively young, active surface of Europa as this activity may allow deep subsurface materials to regularly escape to the surface. NASA had previously evaluated a Europa Lander concept in 2005 with the Europa Lander Mission concept. Also, a lander was evaluated in 2012. There was continued support for Europa missions, including in 2014, when the U.S. Congress House Appropriations Committee announced a bipartisan bill that included US$80 million in funding to continue the Europa mission concept studies. In 18 July 2017, the House Space Subcommittee held hearings on the Europa Clipper as a scheduled Large Strategic Science Mission, and to discuss this lander as a possible follow up. The President's 2018 and 2019 federal budget proposals do not fund the Europa Lander, but it did assign $195 million for concept studies. The launcher would be the Space Launch System (SLS), with a suggested launch in 2025. The SLS is needed given the spacecraft's mass of 16.6 metric tons, including the solid propellant to place the spacecraft into orbit around Jupiter, and the sky crane landing system. One calculated trajectory would see a launch aboard SLS in 2025, Earth gravity assist in 2027, and Jupiter/Europa arrival in 2030. It would spend some time orbiting around Jupiter over the next year to maneuver for its landing on Europa. At Europa it would have to land on the surface, matching its velocity, but with essentially no atmosphere there is no "entry", it is just a descent and landing. The Planetary Society noted that NASA called this DDL— de-orbit, descent, and landing. In 1995, astronomers using the Hubble Space Telescope discovered that Europa has a very tenuous atmosphere composed of oxygen. Compared to Earth, its atmosphere is extremely tenuous, with pressure at the surface predicted to be 0.1 μPa, or 10−12 times that of the Earth. The Europa Clipper, if it was still operating, could function as an additional relay communication spacecraft for the lander. To ensure communication, there is the suggestion to include a telecomm orbiter with the lander mission. A study published in October 2018 suggests that most of Europa's surface may be covered with closely spaced ice spikes, called penitents, as tall as 15 meters. Although the imaging available from the Galileo orbiter does not have the resolution needed to confirm this, radar and thermal data are consistent with this interpretation. This supports the need to first perform high-definition reconnaissance with the Europa Clipper and ESA's Jupiter Icy Moons Explorer (JUICE), both planned to launch in 2022, before planning a lander mission. Once landed, the lander would likely operate for about 20 days by using chemical battery power, rather than a radioisotope thermoelectric generator (RTG) or solar power. One problem with nuclear power is availability: as of 2018 NASA has only enough Pu-238 to power four RTGs. While the Department of Energy began manufacturing Pu-238 again in 2013, NASA is saving its limited supply for other applications such as Voyager-like spacecraft or Mars rovers. The RTGs are famous for powering spacecraft for decades; for example, the Voyager program probes that were designed and launched in 1977 are still operational. On the other hand, solar panels would have to receive enough sunlight and endure the radiation environment. One issue is that solar panels can be significantly degraded by radiation. Previously, NASA had evaluated a nuclear powered add-on Lander to the cancelled Jupiter Icy Moons Orbiter mission, which might have used a small radioisotope power system (RPS) for power. Regardless of the power source, one of the limiting factors for the lifetime of the mission may be surviving radiation; the surface of Europa is predicted to experience 540 rem per day, whereas a typical Earth surface dose is about 0.14 rem/day. Radiation damaged the electronics of the Galileo orbiter during its mission. In 2012 a nuclear powered Europa Lander was evaluated, which would have used two ASRGs. The concept would require funding and further development to be launched, and one of the requirements is to operate in the radiation environment at the moon's surface. The radiation environment at Europa is extreme, so the lander may need additional protection as the Juno Radiation Vault in the Juno Jupiter orbiter. The vault helped reduce radiation exposure to vulnerable systems, especially electronics on the orbiter. Planetary protection guidelines require that inadvertent contamination of a Europa ocean by terrestrial organisms must be avoided, to a probability level of less than 1 in 10,000. The lander (and sky crane) must be assembled and tested in a clean room where all parts would have to be cleaned or sterilized before they are installed in the spacecraft. After delivering the lander, the sky crane is recommended to fly away into Jupiter for disposal. At the end of the mission, the lander might self-destruct using an incendiary device. That system can also be triggered if the spacecraft loses contact with the Earth. The Europa Clipper is a separately launched spacecraft that would lay a foundation for the Europa Lander mission. Previously, NASA had evaluated a lander for that mission as well, but the strong congressional support led to a full separate mission proposal for the lander by 2016. The orbiter/flyby mission is important for a Europa lander in that it will help determine a landing location, characterize the radiation environment, and prepare the way for it. Also in February 2017 the Europa Clipper mission moved from Phase A to Phase B, which includes the selection of instruments. On March 9, 2017, NASA officially named the mission the Europa Clipper. NASA's budget for 2018 did not include funding for the Europa Lander concept, however, there was continued support for the SLS on which the Europa Lander would probably need. Also, there was continued funding for the Europa Clipper. ^ a b c d e f g h "NASA Receives Science Report on Europa Lander Concept". NASA/JPL. Retrieved 2017-02-15. ^ JPL moves ahead with Mars and Europa missions despite funding uncertainty. Jeff Foust. July 18, 2017. ^ a b Final fiscal year 2019 budget bill secures $21.5 billion for NASA. Je3ff Fout, Space News. 17 February 2019. ^ a b c Schulze-Makuch, Dirk. "A New Lander Concept for Europa". Air & Space Magazine. Retrieved 2017-02-15. ^ a b c d e f g "Report lays out science case for Europa lander - SpaceNews.com". SpaceNews.com. 2017-02-14. Retrieved 2017-02-15. ^ a b c d e Europa Lander Study 2016 Report (PDF). NASA, 2016. ^ "Report lays out science case for Europa lander - SpaceNews.com". SpaceNews.com. 2017-02-14. Retrieved 2017-02-18. 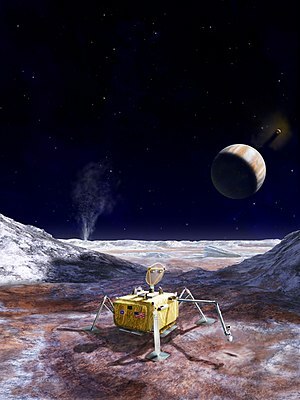 ^ "NASA Report Sheds Light On Europa Lander Mission". Retrieved 2017-02-15. ^ Coldewey, Devin. "NASA's concept Europa lander belongs on the cover of a sci-fi pulp – TechCrunch". Techcrunch.com. Retrieved 9 September 2017. ^ "Deep sea ecology: hydrothermal vents and cold seeps". Retrieved 2017-02-18. ^ Loff, Sarah (2015-05-01). "Reddish Bands on Europa". NASA. Retrieved 2017-02-17. ^ "Small RPS-Enabled Europa Lander Mission" (PDF). NASA–JPL. 13 February 2005. ^ Khan, Amina (January 15, 2014). "NASA gets some funding for Mars 2020 rover in federal spending bill". Los Angeles Times. ^ https://www.aip.org/fyi/2017/balance-nasa-planetary-science-missions-explored-hearing. American Institute of Physics. 21 July 2017. ^ a b c Trump Budget Proposal Axes NASA's Europa Lander Project. Mike Wall, Space.com March 16, 2017. ^ FY19 Appropriations Bills: NASA - Europa Missions. American Institute of Physics. 20 June 2018. ^ Space Launch System, planetary exploration get big boosts in NASA budget. Stephen Clark, Spaceflight Now. 23 March 2018. ^ a b Europa lander concept redesigned to lower cost and complexity. Jeff Foust, Space New. March 29, 2018. ^ a b "Europa lander work continues despite budget uncertainty". SpaceNews. Retrieved 2017-03-31. ^ a b c d "NASA's audacious Europa missions are getting closer to reality". Planetary.org. Retrieved 2017-02-22. ^ McGrath (2009). "Atmosphere of Europa". In Pappalardo, Robert T.; McKinnon, William B.; Khurana, Krishan K. Europa. University of Arizona Press. ISBN 978-0-8165-2844-8. ^ a b c Formation of metre-scale bladed roughness on Europa’s surface by ablation of ice. Daniel E. J. Hobley, Jeffrey M. Moore, Alan D. Howard, and Orkan M. Umurhan. Nature Geoscience. 8 October 2018. doi:10.1038/s41561-018-0235-0. ^ Jagged ice spikes cover Jupiter’s moon Europa, study suggests. Wahington Post. 23 October 2018. ^ a b c Billings, Lee. "NASA Struggles over Deep-Space Plutonium Power". Scientific American. Retrieved 2017-07-21. ^ "SPIE Newsroom :: Modeling radiation degradation in solar cells extends satellite lifetime". spie.org. Retrieved 9 September 2017. ^ Ringwald, Frederick A. (29 February 2000). "SPS 1020 (Introduction to Space Sciences)". California State University, Fresno. Archived from the original on 20 September 2009. Retrieved 5 January 2014. ^ "Galileo Millennium Mission Status". NASA/JPL. Retrieved 9 September 2017. ^ "Here's what NASA's Europa lander could look like". Popular Science. Retrieved 2017-02-15. ^ NASA Asks Scientific Community to Think on Possible Europa Lander Instruments. NASA. May 17, 2017. ^ "Europa Lander – In Depth | Missions – NASA Solar System Exploration". NASA Solar System Exploration. Retrieved 2017-02-22. ^ "NASA weighing dual launches of Europa orbiter and lander - SpaceNews.com". SpaceNews.com. 2016-02-01. Retrieved 2017-02-18. ^ Berger, Eric (17 November 2015). "Attempt no landing there? Yeah right—we're going to Europa". ARS Technica. pp. 1–3. Retrieved 2016-01-05. ^ "NASA's Europa flyby mission moves into design phase". Phys.org. Retrieved 2017-02-22. This page was last edited on 19 March 2019, at 01:12 (UTC).